In the beginning of this year, soon after assuming the highly regarded post of the Chief Justice of India, Justice R.M. Lodha stunned the country with his revolutionary vision of a speedy and free justice delivery system, which works “365 days a year”. While addressing the legal fraternity in Jodhpur at the foundation-stone laying ceremony of a Bar Council of Rajasthan building, he drew parallels between the justice delivery system and other requisite services like the medical & health facilities. He added that, “Law and justice field has its dignity and it must be maintained in order to keep the trust of the people in judicial system”. 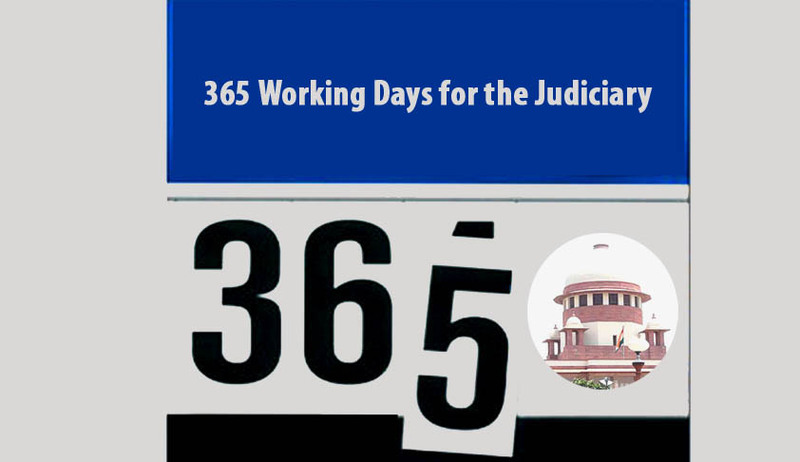 The debate has frenzied, with the Bar Council of India proposing the same 365 day work mechanism and sounding its state entities on the issue. The proposal has already been rejected by the Kerala High Court Advocates Association at its extraordinary meeting on May 28. Its stand will be clear with the meeting planned to be conducted today. Senior advocates, G Sreekumar, V P Seemanthini, M P Ashok Kumarm and A Abdul Hassan along with high court practicing advocates, S U Nasar, T K Koshy, Sunny Mathew and Lekha Suresh among others, reportedly supported the existing mechanism. Association President S.P. Chaly has been assigned the task to represent the non-consenting members in Delhi. Bar Council of Kerala share like views on the matter. A Deccan Chronicle report quotes Council chairman, T Abdul Azeez as describing the idea to be absurd. While both the Bar Council chairman and vice chairman will contribute to the June 4 meeting, the council is meeting on June 8 in Kochi to discuss the issue in depth. Even the legal fraternity in Jodhpur has opposed Rajasthan High Court’s approval of the Supreme Court’s proposal. A meeting organized by the Bar Council of Rajasthan yesterday, reportedly termed the proposal as "impractical and unwarranted", requesting the High Court to withdraw it by June 30. The proposal had been accepted by the full court of the Rajasthan High Court. The members were distressed over the fact that their opinion wasn’t sought before taking such a huge decision. Work has been suspended on Friday, as a mark of protest against the decision. This clearly portrays that a better understanding of the proposal is necessary. Justice Lodha had explained TOI, "It is not such a difficult task. There is not going to be any increase in the number of working days or working hours of any of the judges. At the beginning of the year, the judges would be required to tell the desk managing court sittings when they would like to avail vacations and holidays. Accordingly, a calendar would be prepared for arranging the benches in the Supreme Court and high courts to ensure that judiciary functions throughout the year." At present, the Supreme Court has 193 working days, HCs 210 days and trial courts 245 days a year. As far as productivity goes, the proposal could actually prove helpful to clear the log jam of cases. If 15 benches hear cases for 193 days a year, it comes to 2,895 benches a year. But if 10 benches sit for 365 days a year, it would result in working of 3,650 benches, leading to an increase of 26%. The Chief Justice had also seen this as an opportunity for young advocates to test and sharpen their skills. Hence, there needs to be a dialogue between the accepting and the non-consenting parties in order to address all the concerns and consider this haven to clear the backlog of cases plaguing the judiciary for years now. Legal News India, Supreme Court News, Indian Legal News, Indian Judiciary, Working Days of Judiciary.